As marketers and market researchers, we’re constantly trying to understand consumer behavior so we can better tailor products and services to their needs. Therefore, a thorough understanding of how people make choices is crucial to beating the competition. One way to understand how consumer make choices is by replicating a complex reality in human decision-making using a model that captures the main drivers of choice. The Random Utility Model (RUM) is the most commonly used conjoint model, in which consumers select the product that offers them the best value (i.e. utility) based on a combination of product characteristics. An alternative and lesser-known model is Random Regret Modeling (RRM), which assumes that, rather than going for the optimal product, consumers aim to minimise the potential regret of missing out on some product characteristic(s). Both approaches have their pros and cons, and each is more or less suitable in different market situations. In an effort to improve the predictive validity of conjoint results, our researchers compared and combined the utility model and the regret model by means of a case study about buying tablet devices and posed the question: would a hybrid model lead to more realistic results? This article was later featured by Asia Research magazine. “To answer this question, researchers at SKIM set up a study in which they examined the choice behaviour of consumers buying tablets. The utility, regret, and hybrid models were applied to this same data set to determine which model best fits the data and which model has the highest ‘hit rate’ – a measure of predictive accuracy. As we reviewed the results of the three different models, we saw that the difference in both data fit and predictive validity between the hybrid model and the utility model was rather small. Only the pure regret model performed less effectively. Moreover, the average correlation across the three methods was 0.95. In other words, none of the models clearly outperformed the others in these terms. Even though the accuracy of predicting choices was similar, the predicted shares for hypothetical scenarios in simulation models based on each approach were not. A closer look reveals that large differences exist in the predicted shares. In the example scenario below, all three methods predict limited shares for Product 2. However, using the utility model, Product 1 clearly performs better than Product 3. 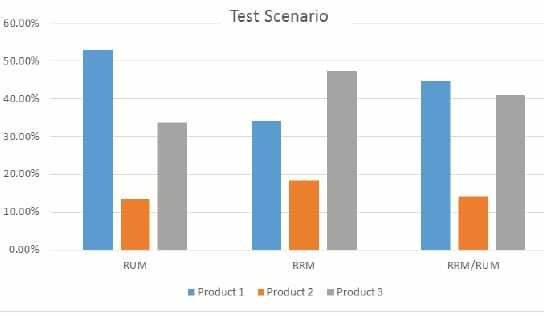 While using the regret model, Product 3 performs better. The hybrid approach predicts that both Products 1 and 3 will perform similarly. Therefore, the same data could potentially lead to different recommendations. In terms of statistical predictive validity, the most often-used utility model still performs well. As a simplified model of complex choice behavior, it’s still a solidly reliable tool. That said, the utility model is more likely to overestimate the ‘rational’ utility-maximizing decision behavior of consumers, potentially leading to skewed insights. Read the full article about this hybrid solution in predictive modeling on Asia Research.